In western culture, smell is the most undervalued of all the senses, as evidenced not least by the linguistic adoption of sensorial terms for commendation or compliment as opposed to the mainly derogatory examples that use smell – with the exception, perhaps, of the slightly ambivalent ‘fragrant’. The demotion of smell in western cultures in line with the advances of rationalism and sanitation, would appear to be concurrent with a similar ‘deodorization of theatre’ that occurs with Naturalism. Smell is enjoying a renaissance in both theatre and scientific research. 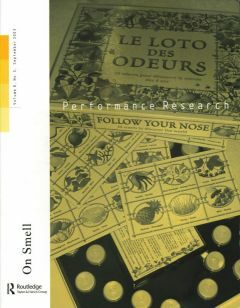 The relationships between smell and performance are diverse, as are its historical precedents. 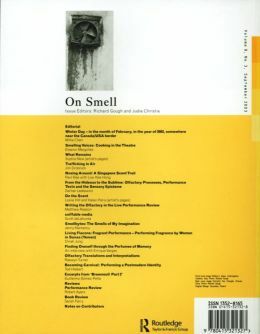 On Smell investigates the olfactory in performance as an aesthetic or representational strategy, as a potential for new performance work, as well as in its performative aspects in daily life, and in discourses about smell, especially in regard to identity, commodification, psychology, neurology, medicine, therapy and environmentalism.